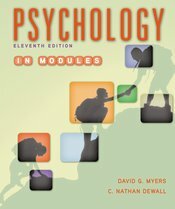 In this version of Psychology, Twelfth Edition, David Myers and Nathan DeWall break down the new edition's 16 chapters into 53 modules, assignable in any sequence and brief enough to be read in one sitting. It’s a format favored by a wide range of students and instructors, one that’s supported by substantial research showing that students working with shorter reading assignments develop a deeper understanding of the material.The new edition of Modules includes the same new features and content of Psychology, Twelfth Edition, including hundreds of new citations and new infographics. And like Psychology, Twelfth Edition is more than ever a fully integrated text/media learning package, with the modular edition’s LaunchPad now featuring dozens of new Concept Practice activities.